Successful startups have a key differentiator from the unsuccessful. That's nearly tautologically true. As I observe the many startups that come out of successful incubator programs such as Y Combinator, TechStars, and 500 Startups, I wonder -- which will break out? What will the differentiators be? As an incubator, I applaud Y Combinator. Y Combinator itself is bold, innovative, and disruptive -- in the venture/angel financing space. 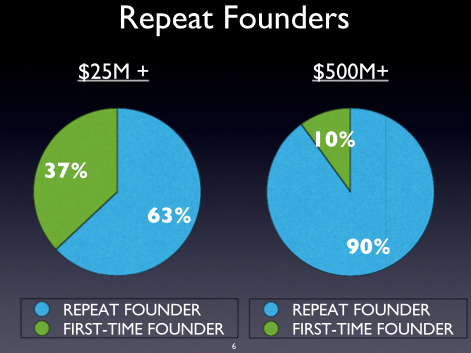 It's changed the way in which early stage investing is done. Its differentiators are its methodologies to selecting, supporting, and funding startups. It's too early to tell, but I think it is well on its way to success. The "fast followers" -- e.g. TechStars and 500 Startups are probably injecting significant innovation into this process as well. As for others, I'm not sure how they differentiate themselves. I think this April Fool's day parody says is all. But what about the companies coming out of the incubators? Oftentimes, the incubators are compared to "boot camps." They get everyone on the same page. A great network of mentors, potential investors, and other entrepreneurs are available. I assume everyone gets pretty good access for the taking. And, from an infrastructure perspective, there's a lot stuff that is readily available -- from office space to fast Internet access to startup docs (like term sheets and incorporation paperwork). It all sounds good. Your access to this infrastructure allows you to focus on what matters. But therein lies a problem -- are these companies too much alike? Further, is there perhaps an opportunity to innovate around what is dismissed as commoditized infrastructure? Are companies coming out an incubator like gingerbread men stamped out from a cookie cutter? All the cookies have the potential to be good -- but only the great survive and thrive. And, great means being different and innovative. What will be the differentiators between one start up and another that allows one to thrive and the others fail? Is it technology innovation? Many claim this is not the case -- or is unlikely to be the case. Open source software, Amazon AWS, cheap hardware -- is it now too hard to compete on this front? Or unnecessary? Some claim it will be design or user experience. Possibly. However, will design be commoditized or end up being squirted out of the same incubator/group think methodology? Or, instead of commoditizing design, will programs like the designer fund foster innovation and allow companies to build differentiators around ui/ux/ia/etc. -- design? We'll see. Or maybe it's in personnel. If you are not a twenty-something male with a technology background, does your experience/age differentiation bring a competitive advantage to the table? On the other hand, perhaps you've decided to outsource your engineering to a team in India, China, or South America. At this point, I think you all most by definition are treating technology (personnel) as a commodity with little room for innovation. Perhaps it's all in the business model, marketing, or operational excellence. I'm talking about pricing, media strategy, M&A, financial engineering, supply chain management, etc. If so, will we see the return/emergence of the MBA's once again? What about Charity Blossom, you ask? Well, we don't quite fit the typical profile of a company that might fit into one of the incubators. So, we're not taking that route. We're an experience team that's worked together for a dozen years. We've had a monster success in the dot-com heyday and have recently successfully exitted our most reason venture, MechantCircle. We're leveraging our knowledge and experience from the past into a new domain. We've "been around the block" a few times -- we're a "well oiled machine." Plus we're taking a differentiated approach to the capitalization of the company, which I think is a competitive advantage (we tread a little carefully -- we're aware too much innovation here can be problematic). In the end, we're successful startup people. Our background is biased towards technology, product, and engineering -- but we've essentially the prototypical hacker+hustler+designer (with a boat load of product talent to boot). It might be a little premature, but we're now opportunistically looking for a great marketing person. Branding, positioning, media, and messaging -- marketing -- are going to be key to our success. (Are you the killer marketing person that wants to join us)? It's all early stage for Charity Blossom -- success is far from certain. However, we are acutely aware that the path we are taking is not the well beaten one -- we're not moving together with others through an incubator. We believe we are on a innovative and differentiated path -- a path to success.